A boarding school or house in Burmese is called ဘော်ဒါဆောင် | bau2-da2 hsoun2 where the first word is the English loaned word "boarder", and ဆောင် | hsoun2 means a hostel, dormitory or a hall. Those in the same boarding house become buddies and they call one another ဘော်ဒါ | bau2-da2. So, the word ဘော်ဒါ | bau2-da2 has evolved to mean buddy even if you don't go to the same boarding school. You will hear this usage by the younger generation of Burmese people in this short clip. If you are obviously a foreigner from the way you look or dress, people will be curious where you came from. We will start with some likely phrases that they will ask you when you meet new people in Myanmar. Myanmar Grammar Notes: Burmese question words such as ဘယ် | beare2 and ဘာ | ba2 can be either pronoun or adjective depending on how the sentence is constructed. If the question word makes a clear reference to the noun in the sentence, it is an adjective. Take note that you can use နိုင်ငံ | nine2-ngan2 and တိုင်းပြည် | tine3-pyi2 interchangeably when asking the question: "Where are you from?". When answering that question, the word ပြည် | pyi2, which is the short for တိုင်းပြည် | tine3-pyi2 (country) is added to a few exceptional countries. ဂျပန်ပြည်ကပါ | ja1-pan2 pyi2 ga1 ba2 -- I am from Japan. တရုတ်ပြည်ကပါ။ | ta1-yoat pyi2 ga1 ba2 -- I am from China. ကုလားပြည်ကပါ | ka1-la1 byi2 ga1 ba2 -- I am from India. မြန်မာပြည်ကပါ | ba1-ma2 pyi2 (myan2-ma2 pyi2) ga1 ba2 -- I am from Burma (Myanmar). ပြင်သစ်ပြည်ကပါ | pyin2-thit pyi2 ga1 ba2 -- I am from France. Note: Although the word Ka1-la1 byi2 is commonly used among Burmese to mean India, the more politically-correct term is အိန္ဒိယ | Ain2-di1-ya1 without pyi2. စင်ကာပူ ကပါ | sin2-ga1-pu2 ga1 ba2 -- I am from Singapore. အမေရီးကား ကပါ | a-may2-yi3-ka3 ga1 ba2 -- I am from the USA. ကနေဒါ ကပါ | ka1-nay2-da2 ga1 ba2 -- I am from Canada. ဂျာမနီ ကပါ | ja2-ma1-ni2 ga1 ba2 -- I am from Germany. For a few countries that Burmese have been in touch with for centuries like China, India, France, and Thailand, there are already Burmese words for those countries. ယိုးဒယား ကပါ | Yo3-da1-ya3 ga1 ba2 -- I am from Thailand. Some of the old words from the past generations are no longer in use, including ဘိလပ် | Bi1-lut derived from the Hindi word Wilayat for England, ရောမ | Yau3-ma1 for Rome (Italy), and ခေါမ | khau3-ma1 for Greece. Names of countries in Burmese Script are given in the table on the left column. Take another note that there is no "you" in the above sentences as it is understood that the conversation is about "you" or "he" or "she" right there at that moment. The speaker could be either directly talking to you, or asking that question about you through the translator. It appears that some Westerners who translate Burmese into English try so hard to include the word "you" in sentences such as ခင်ဗျား | kha1-mya3 (used by male speaker) and ရှင် | shin2 (used by female speaker). Can you speak xxxx ? သလား | tha1-la3 -- ? အင်္ဂလိပ် စကား ပြောတတ် သလား | In3-ga1-late za1-ga3 pyau3 tut tha1-la3 -- Can you speak English? The question သလား | tha1-la3 is almost the same as လား | la3. The extra သ | tha1 in Burmese spoken language appears to come from the ending word သည် | dthi2 in the written language, which is the affirmation word. So, tha1-la3 probably expects the answer "yes" more than la3. ဗမာစကားပြောတတ်လား | ba1-ma2 za1-ga3 pyau3 tut la3 -- Can you speak Burmese? နည်းနည်း ပြောတတ်တယ် | neare3 neare3 pyau3 tut deare2 -- Yes, I can speak a little. It will come to you as a shock, but your name is also not a central importance in the first meeting (unless you are a foreigner) as people can still address to each other as "brother" and "sister", or simply omit it. In the formal business meetings, it's more likely that the third person will introduce your name and the name of the person that you just met, so you will never have to use the phrase "What's your name?" For the Burmese people, it is more likely that people will get to know each others' names through the acquaintance than directly asking "What's your name?" Here again, some Western translators of Burmese (Myanmar) Language seem to think this question as an important phrase, complete with the use of the word "you". If you must ask the name of the person you just met, just omit the word "you". နာမည် ဘယ်လိုခေါ်လဲ | nun2-meare2 beare2-lo2 khau2 leare3 -- What's your name? Is it rude to be asking someone's name in the first meeting? No, it's not. You can go ahead and ask if you need it for the next meeting. Since you are a foreigner, you cannot rely on acquaintances, friends and family to know someone new. Let me give some examples on how Burmese people ask someone's name. I go to a place to pick up a package. I knock on the door. Someone comes out to the door. I say: "I am here to pick up the package." ဘယ်သူလဲ မသိဘူး | beare2-thu2 leare3 ma1 thi1 bu3 -- Don't know who? Who could that be? လို့ | lo1 -- particle used in making a report that someone has said "such and such". မလဲ | ma1 leare3 -- ? This question is roughly equivalent to "Who should I tell him is here?" (or) "Who should I tell her is on the line?" This is also the question that you can ask to people that you meet in Myanmar. The main ethnical groups in Myanmar are Kachin, Kayin, Chin, Shan, Rakhine, Mon, Kayah, and Bamar (Burmese), not counting minor tribes like Wa, Palaung, Lisu, Salone and so on that add up to more than 100 distinct languages and dialects spoken in this country. In Myanmar, those with Chinese and Indian racial background are also important groups who play a major role in the economy. They add to the rich flavor of multi-racial culture as well as cuisine in this country. There has been a lot of controversies and debates as to whether to use the word Burma or Myanmar for this country. Burma is the name known by the western world for several decades because that's how the British called this land as they colonized it for more than a hundred years. Some don't accept the change of the name of the country to Myanmar by the previous military government that they despise. Some argue that the name မြန်မာ | Myanmar is more representative and inclusive of the ethnic groups, while Burma represents only the main racial group known as ဗမာ | "Bamar" who speaks Burmese. Does it really matter? A rose by any other name is still a rose. The word တည်း | teare3 is used for a place where you temporary stay in your visit. It might be a good idea to invite your new Burmese friend something to eat, or go for a drink where you can have a small talk. Myanmar Grammar Notes: English speakers might expect the word "near" to be an adjective. In the above Myanmar sentence, it is used as a verb. To use this word as an adjective, suffix particle must be used. means shop that is near. နီးတဲ့ဆိုင်ရှိလား | ni3 deare1 hsine2 shi1 la3 -- Is there a shop nearby? If you are already in the restaurant or in an eating place, or can see one nearby, drop thwa3 (to go) from the phrase. I have already covered how to order food or drink in Lesson 15. As you sit down around the restaurant table waiting for the food to come, you can make small talks with your new Burmese acquaintance. It's a good idea to ask his or her name now if you haven't done so already, because we will include the name in some of the phrases. Although Burmese sentences can be formed without the word "you" or names as mentioned above, including the name of the person in the conversation of personal nature put more warmth to it. Here, you should address yourself as ကျွန်တော် | kja1-nau2 for "I" if you are a man and ကျွန်မ | kja1-ma1 if you are a lady as discussed in Lesson 4. ကျွန်တော် ကတော့ ဘာလဲမသိပါဘူး | kja1-nau2 ga1-dau1 ba2-leare3 ma1 thi1 ba2 bu3 -- As for me, I don't know what. That's probably a better response if your religion is different, or if you are a free thinker. However, if you are really religious, and your religion prohibits you to do or eat certain things, it's best to come up with a straight answer. 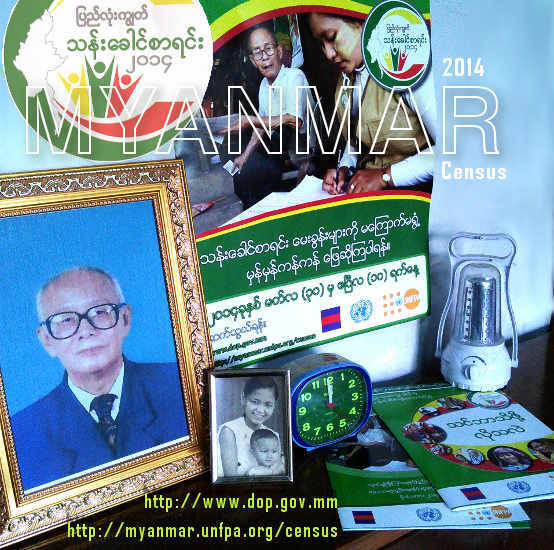 ပြီလဲ | byi2 leare3 -- has reach what level, number, or state? ကလေး ဘယ်နှစ်ယောက် ရှိပြီလဲ | kha1-lay3 beare2 hna1-yout shi1 byi2 leare3 -- How many children do you have? ပြီလား | byi2 la3 -- has reached certain condition or state or not? ကလေးတွေ ကြီးပြီလား | kha1-lay3 dway2 kji3 byi2 la3 -- Have the kids grown up already? The question word ပြီလား | byi2 la3 has been explained in lesson2. ဟုတ်တယ် ရှင်းပြပြီးပြီ | hote deare2, shin3-pya1 pyi3 byi2 -- Yes, I have explained it already.